In 2014 the community worked with the Fred Meyer in Lake City to begin discussion on transforming the green strip just south of their location into a green space. What followed was a robust community outreach process and the determination to do something that would improve the aesthetic of the location and in turn mitigate some of the impact of the dilapidated wall adjacent to the property that is viewed by thousands of commuters and community members every day. As I launched this project I had no idea that now, almost five years later, there would be nothing to demonstrate all the work and negotiations and learned lessons that accompanied this project. At this point because we were never able to reach an agreement that was not too high risk for a small community based organization to undertake within the lease agreement and insurance requirements the project has stalled out indefinitely. In addition to the requirements of the lease agreement we also stumbled with the opposition to the project from the adjacent property owners who’s “buy in” on the project also became part of the agreement with Fred Meyer. The wall and the green space are one of the most frequently inquired about areas of our neighborhood. While we are back at square one with the project we have not given up hope but did feel that the community deserved an update. I have maintained the past posts on the project below for reference. New efforts are hatching and we hope that you will stay tuned as we look to improve this vital location along our commercial corridor. In 2014 Fred Meyer’s corporate offices agreed to allow our Lake City community to transform a green strip directly south from their Lake City location into a community garden. This was a direct result of volunteer efforts by Lake City Future First. The goal of the garden is to provide our economically and culturally diverse community a chance to work together to transform a common area into something that will provide a sense of pride and a variety of volunteer opportunities. Although the project has languished a bit much has happened in preparation to begin work on the space. Two community survey processes, professional design recommendations, multiple opportunities for public input and relationship building with Fred Meyer have all been wonderful components to the process. Out of the process the community has identified that improvements to the space would concentrate on aesthetics and ecology. Few would argue that the current space lacks visual appeal. This location is highly visible – viewed by thousands of commuters each day. The transformation would help change perceptions about the area and encourage potential consumers to stop by our civic core. The space also offers a pedestrian passage for people traveling from Lake City Way to 33rd Avenue and back. The potential to book end one of the most diverse streets in the City with the future park on 33rd Avenue adds a new level of excitement. The location’s proximity to 33rd offers a unique engagement opportunity to work with many under-represented groups within our neighborhood. The main goal of the garden has been broad community outreach, volunteer opportunities, community building and a chance for educational opportunities. For example, the Little Brooke culvert runs under the space and is day lighted a short distance away as it joins Thornton Creek. The current state of the process is ensuring that issues such as the lease agreement and the insurance requirements are something that we are able to take on. We have also realized what a great opportunity this is to report back to the community on how a process like this unfolds. The educational opportunities inherent in this type of project need to be fully explored. One of the major concerns that we have heard is regarding the safety and maintenance of the space which has led us to realize that more conversation and solid planning for the success of the project are needed. The “Friends of the Lake City Fred Meyer Garden Project” have been involved since very early in the process and is made up of residents, professionals, service providers and University of Washington Students. 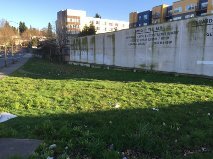 The “Friends of the Lake City Fred Meyer Garden Project” (FOLCFGP) will be looking to a new level of support for the success of the space. We will be coming back to the community for volunteers willing to work closely with us on a maintenance plan and a commitment to help this project be successful and maintained going forward. Two Neighborhood Matching Grants have been secured for outreach, design and moving the project forward. Two University of Washington Students under the guidance of Marty Curry have been instrumental in the early phases of the project. Integrated Site Design was hired by the “Friends of” Committee to create professional renderings of features to take back to the community for input. Two Community Survey Processes have been conducted, the first to identify the general concepts that people would like to see included and the second a review of the renderings to further determine the most desired elements. Legal and Insurance services have been engaged to work through the lease and the costs associated with completing and maintaining the space. We can’t thank the Lake City Fred Meyer store and their corporate offices for being so willing to work with us and for their patience. The LC Fred Meyer has consistently demonstrated their commitment to the Lake City Community through efforts with the Emergency Hub, support of SalmonFest and this project. As the largest employer in Lake City we are lucky to have such an engaged partner and anchor business like Fred Meyer.